Boy suffering from severe acute malnutrition at a UNICEF nutrition clinic in the Muna informal settlement, which houses nearly 16,000 internally displaced people in the outskirts of Maiduguri, capital of Borno State, northeastern Nigeria, June 30, 2016. 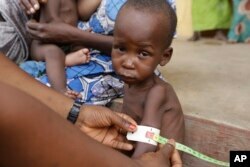 Aid agencies warned on Friday that malnutrition has grown so rife in Nigeria’s war-torn northeast that part of the region could already be in a famine. The United Nations says 4.4 million people in the northeast are “severely food insecure” due to the ongoing war between Boko Haram and the military of Nigeria and its neighbors. Parts that are too dangerous or otherwise cut off from aid agencies could already be in a famine, a report from the Famine Early Warning Systems Network said. “If we do not intervene, it’s going to be a humanitarian catastrophe,” said Sory Ouane, acting Nigeria country director for the World Food Program. The fight against Boko Haram in northeastern Nigeria has gone on since 2009 and drawn in neighboring Chad, Cameroon and Niger. Over 20,000 people have been killed and 2.7 million forced to flee, with many ending up in squalid displaced persons camps in Cameroon or in Nigerian cities such as Maiduguri, Bama and Yola. Starting in 2014, the militants began overrunning towns and cities in the northeast. Nigeria’s military has pushed the insurgents out of most of the areas they captured. But the months of fighting have cut parts of the northeastern Borno, Yobe and Adamawa states from aid. Ouane blamed the fighting and ensuing disruptions in farms and marketplaces for the food insecurity. As more areas of the northeast become accessible to aid agencies, Ouane expects the need for food assistance to grow. “We are highly concerned about the rising number of people facing hunger as their needs become clear,” Ouane said. Last month, Doctors Without Borders said as many as six people were dying daily from disease and malnutrition at a displaced persons camp in Bama. A National Emergency Management Agency official said many of the worst cases of malnutrition at the camp were people who had recently arrived from areas where no humanitarian assistance was available. The WFP aims to get food assistance to 431,000 people by the end of the year, Ouane said, but that could increase to 700,000 if the need grows as aid agencies access more areas. “If we manage to reach them, we will contribute greatly to stabilize their nutrition status and their food security situation,” Ouane said.